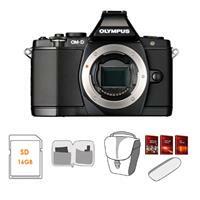 The Olympus OM-D E-M5 is on a $200 rebate! - order now via the links in the box. Important Note: the E-M5 was replaced by the Olympus OM-D E-M5 Mark II (compare ). Use the Compare Tool to compare the E-M5 to other cameras. See where the E-M5 is placed on the Feature Graph. See the list of all Touch Screen Cameras .